It’s time for the U.S. to sanction the leaders of the LEF. In the wake of more than 20 deaths that punctuated the early days of Iran’s nationwide protests, the country’s police chief boldly identified the principal provocateurs. Iranians, declared Brigadier General Hossein Ashtari on January 1, seek primarily better living conditions, but “opportunists exploited this situation with the support of the sworn enemies of the country, headed by America,” to spread discontent. A few weeks later, he accused the West of manipulating Iran’s political divisions to wage a “soft war” against the Islamic Republic aimed at undermining its revolutionary values. It’s a familiar refrain. 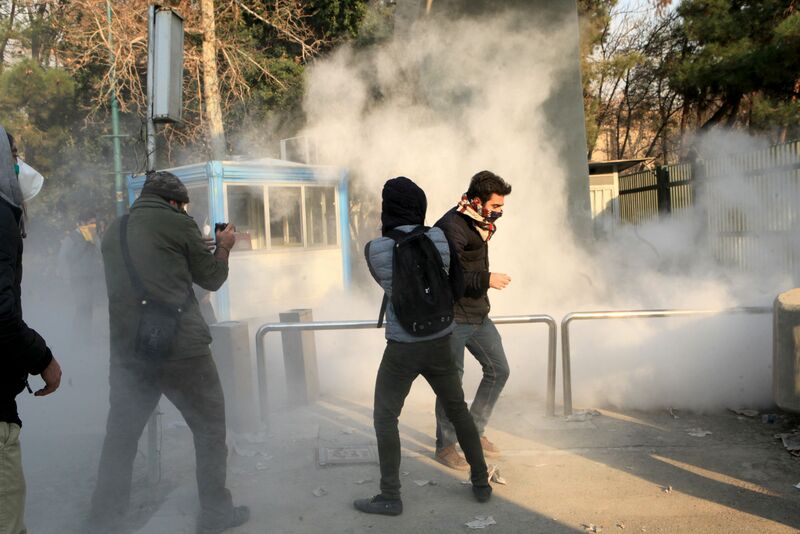 Rather than accept responsibility for violently suppressing demonstrations, the Iranian regime justifies its abuses by citing amorphous Western conspiracies rooted in a paranoid vision of seemingly boundless U.S. power. But Ashtari, of all people, ought to know better: The Iranian police, along with other paramilitary forces, constitute the main executor of Tehran’s bloody crackdown. To counter Ashtari’s narrative and bolster global pressure on Iran for its systemic human rights abuses, the United States and the European Union should sanction the police chief and his top deputies. Iran’s police, formally known as the Law Enforcement Force (LEF) of the Islamic Republic of Iran, or NAJA, its Persian acronym, function not merely to ensure law and order. Rather, as Supreme Leader Ayatollah Ali Khameni, who directly appoints the police chief, said in a 2015 speech, the LEF’s responsibilities include the establishment of physical as well as “moral and social” security. Put differently, the police aim to preserve the regime’s rule and enforce the Islamist ideology that drives it. This is an understatement. Since late December, the LEF has killed dozens of people and arrested thousands more. Police officers have fired live ammunition into crowds and beaten demonstrators. The LEF has deployed forces on the streets simply to intimidate citizens and deter unrest. Protestors, for their part, recognize that the LEF seeks to protect the regime, not them: Rallies have routinely unfolded in front of LEF police stations. In some cases, Iranians have attacked the facilities and set them ablaze. Moreover, the LEF has played a key role in Iran’s efforts to block the internet. Its cyber police unit monitors Iranians who voice even mild opposition to the regime’s policies or who try to spread word about the protests through social media. Arrests and torture often follow. Nevertheless, millions of Iranians have used circumvention technology to evade censors. In late April, the regime adopted a more aggressive approach, blocking Telegram, a messaging app used by some 40 million Iranians. The LEF has also contributed to Bashar al-Assad’s atrocities in Syria, the regime’s foremost regional ally. In conjunction with Tehran’s Islamic Revolutionary Guard Corps and intelligence agencies, the LEF has advised and assisted Assad’s ruthless security forces in order to preserve his grip on power. In 2011, Ahmad Reza Radan, then-deputy chief of the LEF, visited Damascus to share his expertise in forcibly subduing protests. The Obama administration recognized the LEF’s malign role, sanctioning the force itself, as well as Radan and other LEF officials, for the organization’s human rights abuses in Iran and Syria. The EU, for its part, has sanctioned former LEF chief Esmail Ahmadi-Moqaddam, Radan, several other lower-ranking LEF officials, and the cyber police unit. The LEF’s current leaders, however, including Ashtari, whom Khamenei appointed in 2015, have thus far escaped designation by Washington and the EU. But the latest protests highlight the urgency of renewed attention to the LEF’s grisly conduct. By designating Ashtari and the LEF’s other top brass, America and the EU can increase pressure on Tehran to halt its brutality. Justice for Iran, a London-based human rights group, has identified five such LEF officials, including Tehran division chief Rahimi; Mehdi Masoum Beigi, commander for Esfahan province; Hassan Nikbakht, commander for Falavarjan district; Mohammad Malekshahi, commander for the city of Doroud; and Kiumars Azizi, commander for Markazi province. In his May 21 speech announcing the Trump administration’s new Iran strategy, Secretary of State Mike Pompeo declared that Tehran “must improve how it treats its citizens. It must protect the human rights of every Iranian.” Just over a week later, Washington announced a series of new sanctions against Iran’s notorious Evin Prison and eight other human rights violators. America should now build on these efforts by targeting the leadership of Tehran’s state police.